Hanoi is Vietnam’s small capital city, serving as the entry point for visitors drawn to the country’s mountainous north and the craggy islands of Halong Bay. With a French accent and a venerable old heart – largely spared from American bombings – it’s full of bustle, but more attractive than sprawling Saigon in the south. The focal point is Hoan Kiem lake, a green oasis with an island pagoda, steeped in legend and caressed by the fronds of banyan trees. The French Quarter’s boulevards and faded colonial buildings spread from its southern shore, and to the north is the web of lanes that make up the Old Quarter. If it weren’t for the mopeds nipping at your heels, you could feel little has changed on these narrow streets – each home to a historic guild, with merchants plying the same wares as the generations before them. Taking a stroll here is a thrill in itself, threading between a cacophonous, fluid stream of overloaded scooters, wobbly bicycles and women shouldering bamboo canes. There are pavements, but this is where locals chop vegetables, bounce babies, park bikes and play makeshift badminton. All aspects of life are played out on the streets and that's part of the city’s allure. Visitor numbers are increasing, as are the options for touring beyond Hanoi. The dry season in the north lasts until February. Vietnam Airlines (vietnamairlines.com) flies direct to Hanoi twice a week from London Gatwick, from £629 per person, incl taxes. Sofitel Metropole (1) (15 Ngo Quyen; sofitel-legend.com/hanoi) is Hanoi’s best historic hotel, in a grand French building near the opera house. One wing dates from 1901 and has suites dedicated to former guests Graham Greene, W Somerset Maugham and Charlie Chaplin. Doubles from £134, not including VAT or breakfast. Ha Noi Pearl (2) (N6 Bao Khanh; hanoipearlhotel.com) is mid-range by Hanoi’s standards, but still very affordable to Western visitors. Brand new and in the centre of the Old Quarter, it has wooden-floored, European-style rooms that are larger than most. Doubles from £40. Hotel Anise (3) (22 Quan Thanh; anisehotel.com) is a boutique property with spotless rooms in a small tower just north of the market. Aim for an upper floor to be away from traffic noise. Doubles from £30 with breakfast. Indulge in inventive French cuisine at the Metropole (as above), where President Putin stayed during my visit. Mains start at around £12. The atmospheric lounge bar, hosting prominent jazz singers, is good for a digestif. The Thang Long Water Puppet Theatre (4) (57b Dinh Tien Hoang) is justifiably popular for its entertaining romp through Vietnamese folk tales. Serpents chase fishermen, amorous phoenixes dance – all set to traditional songs played by live musicians. Rise early to witness the city at its calmest. At Hoan Kiem lake, limber elderly locals practise tai chi. Stop for a coffee (Vietnamese brews are sweetened with condensed milk and are addictive) at the lakeside terrace of Hapro Bon Mua. 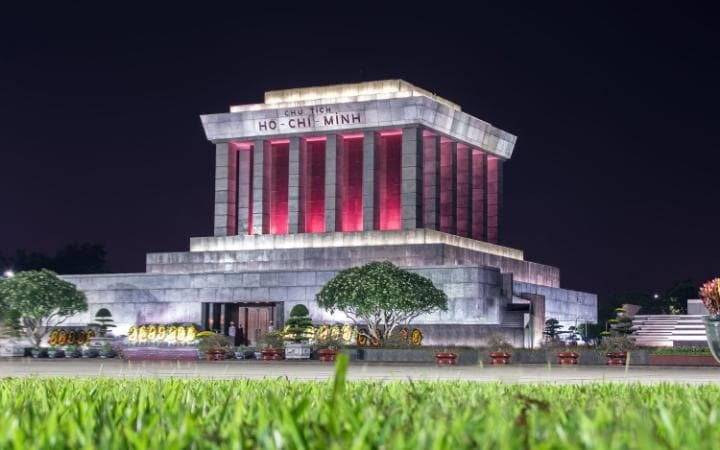 The imposing mausoleum (5) (Huong Vuong), where the embalmed body of Ho Chi Minh, the father of modern Vietnam, lies in a chilled glass tomb, must be visited before 11am. Those paying their respects are asked to file past in a solemn fashion. The adjacent Ho Chi Minh Museum has heavily symbolic displays about the life of “Uncle Ho”. The Temple of Literature (6) (Quoc Tu Giam) is a fine complex of courtyards and tile-roofed pavilions founded in 1070. Inside is a lake of plump carp, rows of stone slabs engraved with the names of scholars and an altar clouded with incense sheltering a statue of Confucius. Nearby, the Doan Mon Gate is one of the few standing remnants of Hanoi’s Citadel (7) (Quán Thánh). The site was recognised as a World Heritage Site by Unesco in 2010, and recent findings are kept in a small museum. For the perfect introduction to Vietnamese food, visit Quan an Ngon (8) (18 Phan Boi Chau), an upmarket food hall with open kitchens around a bamboo-lined courtyard. The menu (in English) features everything from crispy fried shrimp pancakes to noodle soups and fluffy steamed buns. Mains from £2. Remind yourself of Vietnam’s turbulent recent history at the Museum of the Vietnamese Revolution (9) (1 Pham Ngu Lao), which has moving photographs but little information in English documenting the country’s resistance to French colonialism and the Vietnam War. Taking you further back, the Museum of Vietnamese History (10) (1 Trang Tien) has relics from the Neolithic period to the modern day. Alternatively, take a taxi to the Museum of Ethnology, four miles from the centre, for its cultural objects and art from Vietnam’s tribal minorities. Refresh with a glass of bia hoi, a light and ridiculously cheap beer served fresh each day from kegs on the street. It's drunk squatting on plastic stools, knee-to-knee with your neighbour, watching the world go by. These stalls and basic bia hoi restaurants (the best serve grilled pork ribs - the perfect accompaniment) can be found across the city, but head for "bia hoi corner" (the junction of Luong Ngoc Quyen, Ta Hien and Dinh Liet) if you can't see any. Authentic Vietnamese dishes are served at Hanoi Garden Restaurant (11) (36 Hang Manh), in a courtyard set back from an Old Quarter street. Options include a tasty banana leaf salad and honey-barbecued beef. Mains from £3.50. The brave should follow dinner with strong, speciality rice wine at Highway 4 (12) (5 Hang Tre), a bar and restaurant offering three tasting menus. If you would prefer to wake up with a reasonably clear head, the branch of Cong Caphe (35A Nguyen Huu Huan; congcaphe.com), also in the Old Quarter, has coffee, cocktails and a quirky concrete bunker theme with oil-barrel tables, sirens and sackcloth for curtains. Hanoi’s creatives socialise at Zone 9 (13) (9 Tran Thanh Tong), an arty hub that just a few months ago sprung up in a disused factory, with American boutiques, great bars and a VW van serving cocktails. Tadioto is a dark and sultry bar owned by the author Nguyen Qui Duc, while Barbetta 2 is an appealing loft space with a good sound system and live music. For city views, try the Summit Lounge bar at the Sofitel Plaza (1 Thanh Nien Road; sofitel.com). Return to Hoan Kiem lake, this time crossing the much-photographed red bridge to the Ngoc Son island pagoda (14). Hoan Kiem means “lake of sword restored”, in reference to the victorious emperor Le Thai To, who handed his sword to a giant tortoise. Such animals apparently live in the lake today, and there is a preserved, 2m-long specimen on show next to the pagoda. Each street in the Old Quarter jostles with shops dedicated to a particular trade. For silk souvenirs, shop along Hang Gai; for silver, Hang Bac. Boutique handicrafts can be found around Nha Chung, where there is also the Ha Noi Gallery, selling bold and bright communist posters. 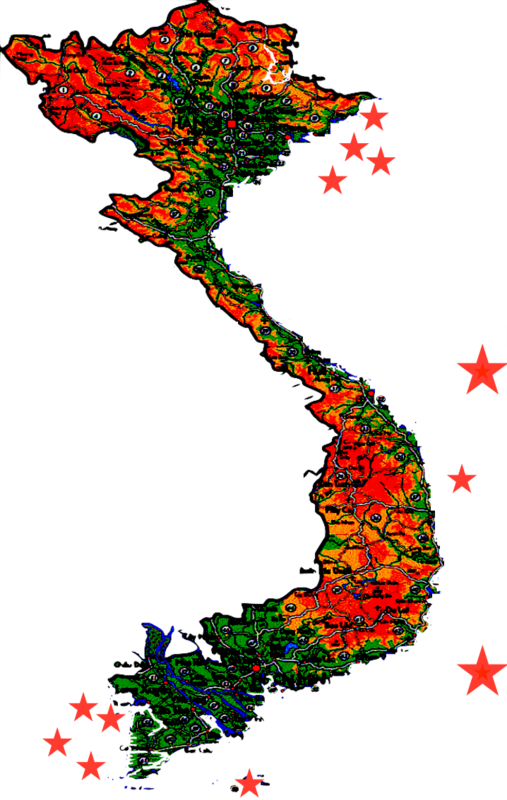 British passport-holders require a visa for Vietnam. A 30-day stay currently costs £54 from the embassy (vietnamembassy.org.uk) in London. Vietnamese street food is fresh, complex and delicious. To discover where to pull up a stool, book a tour with a food blogger through Audley Travel (audleytravel.com). If you have the time, take a day trip to the Perfume Pagoda, a cave temple reached by river.